Conveniently located in the Shida night market, this eatery is famous for its sliced noodles. Thick and chewy, these noodles are individually cut from a large piece of dough the chef holds over a wok filled with water – check out the pictures below for a good visual. Freshly made, these noodles are traditionally put in soup or fried. Definitely worth checking out if you’re in the area and don’t want street food – the prices are almost just as cheap and you get to enjoy the comfort of nice, cool air conditioning (I keep bringing this point up as a big plus because the weather in Taiwan in the summertime is extremely high both in temperature and humidity). 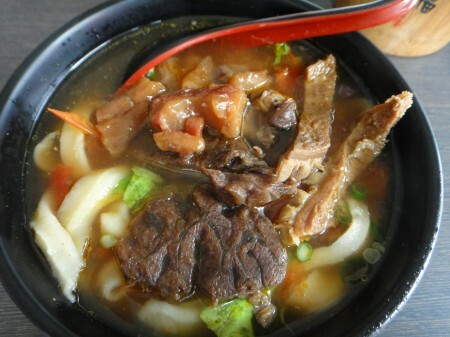 Tags: Beef, Fried, Night Market, Noodles, Pork, Rice, Shida, Soup, Stomach, Taipei, Taiwan, Tendon.